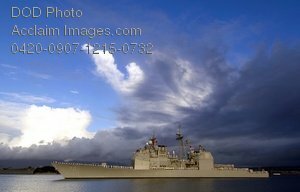 Description: Free, public domain image: Guided Missile Cruiser USS Lake Erie Moored at Pearl Harbor. PEARL HARBOR, Hawaii (Dec. 7, 2007) Guided-missile cruiser USS Lake Erie (CG 70) Sailors man the rails and render honors to USS Arizona Memorial and Pearl Harbor survivors as part of a pass-in-review during a joint U.S. Navy/National Park Service ceremony commemorating the 66th anniversary of the attack on Pearl Harbor. More than 2,500 people joined Sailors, Pearl Harbor survivors and their families and friends onboard Naval Station Pearl Harbor for the annual observance. U.S. Navy photo by Mass Communications Specialist 2nd Class Elisia V. Gonzales.